Some days, you feel like you’re living inside a circus. Each morning, your family races out the door like a herd of elephants. At work, you’re surrounded by clowns and dealing with a dog-and-pony show. You juggle, swing schedules, walk a tight rope, crack the whip, and are often surprised you don’t trip over a tent stake. Life is a circus, but you’ve never lived inside a three-ringer like Le Cirque des R?ves. And as you’ll see in the new novel “The Night Circus” by Erin Morgenstern, neither has anybody else. The circus always appeared quietly, as if it were sneaking into town. Nobody ever remembered seeing signs or hearing a train or sounds of the Big Top setting up. One minute, it seemed, there was a bare field. The next minute, it was filled with black-and-white striped canvas and a sign out front: Le Cirque des R?ves opened at sundown. Few were better suited for circus work than Celia Bowen. Beautiful, almost luminous, Celia was The Illusionist who made silent magic every night in front of an audience, then disappeared until the next show. But magic wasn’t her only job: Celia held the circus together with the talents her father helped refine. When she was just six years old, little Celia went to live with her father. Known as Prospero the Enchanter, Hector Bowen was an illusionist himself, so when he saw his daughter break, then reassemble a teacup using her mind and her eyes, Hector knew that she was stronger than he. Delighted, he called his associate and suggested a little wager. The man in the grey suit saw Celia’s talent, too, and accepted Hector’s offer. The girl was good, but perhaps a student with more maturity and control would be better. With a showman’s flourish in an opening paragraph, author Erin Morgenstern invites readers into a mesmerizing 19th century world where everything and nothing is real, and even the characters don’t know the difference. There are shivers here, as well as a story of betrayal, mistrust, love, and horrifying secrets. I was captivated by this darkly stunning debut novel from an author that bears watching, and there’s no way you should miss it, either. So step right up ladies and gentleman and be amazed at what you’ll find between these fiendish covers. 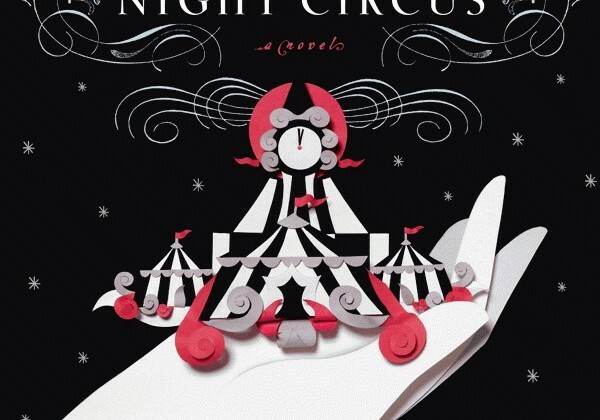 For you, “The Night Circus” conjures a most excellent read.